The advancement of technology is a wonderful thing, particularly in the field of consumer electronics. Not only do devices get cheaper and more functional as time goes on, but they develop wonderful new capabilities. Today’s item under the MyMac review microscope is a case in point. Whereas in times gone past, scanners were large, desk-bound devices connected via SCSI to your Mac. With the IRIScan Executive 2, you get a portable scanner and a full optical character recognition (OCR) suite, all capable of slipping into your laptop bag next to your MacBook. I.R.I.S. provides a pretty comprehensive package. You get the scanner (a thin and light, USB-powered single sheet device), a usb cable, a stand so that it can be mounted vertically on your desk when you are not on the move, and a cloth bag for when you are traveling. You also get a full suite of software – Readiris Pro 11 and Cardiris 4. Readiris Pro can be used to scan pages of documents, and convert those pages to editable documents that are saved out as PDFs or text files. Cardiris is used to scan business cards, allowing them to be archived and stored as contacts on your Mac. So it all sounds good on paper. The execution, unfortunately, is not so slick. Trouble starts with the software installation – despite a weighty manual providing instructions in a variety of languages, the directions given do not match up to the actual software on the CD. Once you have everything installed, all is still not well. The drivers for the scanner are proprietary, rather than complying with the established TWAIN standard, meaning that you cannot use the scanner with iPhoto, Preview or any other Mac OS X application. The scanner sports buttons for initiating scanning, and this relies on an application running to support it – this application starts up with the OS and runs as a a permanent icon in the dock, rather than up in the menu bar where I prefer background applications to sit. The scanner itself did not produce good results for me. The problem is that, as a portable scanner, you have to feed sheets through one at a time yourself. This is a much slower process than with a more conventional flatbed scanner, and the scanning process itself is also fairly slow. In addition, the scanner requires calibration using a special sheet, and it seemed to ask for this quite regularly. More seriously, however, the resulting scans were pretty poor. The portable scanner admits ambient light through the paper feed slots, which degrades the quality of the scans quite significantly. So the hardware is a little suspect. Fortunately, the software is a lot better. Readiris Pro is a fine and powerful piece of OCR software, that can produce very good results. The process for each page is that each group of pixels on a scanned page is identified as text or graphics, and is marked with a bounding box. Once you are happy with these zones, the page is recognized and processed, and can be output as an editable PDF formatted in the same way as the original page, or text can be extracted and saved as an RTF document. Suspect characters that the program is unsure of can be displayed during processing, and corrections made, thereby improving future recognition, and there is full support for correcting, deskewing and despeckling scanned images. Cardiris works in a similar way, but is designed to scan and recognize business cards and save the recognized contacts. Unfortunately, in my experience the deficiencies of the scanner hardware left Readiris with too much work to do. The poor scans resulted in so many recognition errors that it rapidly became unfeasible to try to OCR documents. It wasn’t the fault of the software – the same documents scanned by a flatbed were recognized much more successfully. 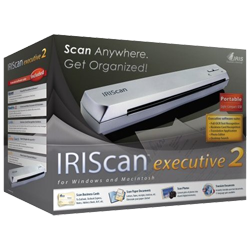 Consequently, as a bundle the IRIScan Executive 2 is a mixed bag – great software but disappointing hardware. At $199, the cost of the bundle is $30 cheaper than the combined cost of Readiris Pro and Cardiris separately, and you get the scanner bundled as well, so if the two software packages appeal to you treat the scanner as a free pack-in and you are getting a good deal. However, as a portable scanner I can’t rate the IRIScan particularly highly – the quality of the Readiris software is the only thing that brings the overall rating up.